This mammoth machine is designed to complete the largest jobs in the smallest amount of time offering a side and rear discharge model. Powered by a huge Kubota 1,123cc 3-cylinder, liquid-cooled diesel engine you will have all the grunt you need to get the job done. The deck is made of heavy-duty 7 gauge steel welded with durable bumper to ensure it can handle the roughest conditions with ease. It is also fitted with a hydraulic deck lift to make the job easier for the operator along with the deluxe seat for optimum comfort when your in control. The cutting deck is made of a super thick 7 gauge steel so it can handle tough conditions with ease. As a matter of fact Toro decks are 33% thicker and 85% stronger than competitive decks made from ordinary 10-gauge steel. 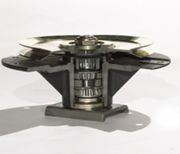 And the spindle assembly is no different with a heavy duty 9" base to withstand the impacts that would damage most other spindles. This system uses wheel motor pumps, a hydraulic wet disc clutch and engine power linkage. 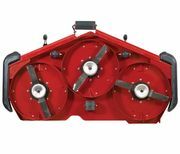 Coupling the transmission directly to the engine removing the need to drive belts creating an efficient and robust design that does not need as much maintenance as your ordinary machine. This application increases the durability of the deck protecting it from debris and objects while also minimising the blowout of grass and dust. This option provides a blade tip speed of 18,000 ft/min which is incredibly fast allowing you to cut onion grass better than other American mowers. It is also fitted with a rubber discharge chute so that the grass is direct away from the mower and towards the ground. This option gives the operator the ability to drop the grass clippings in the path of the mower. Making is suitable for specific jobs that this may require. This seat will provide the operator with optimum comfort and support for their back ensuring even the roughest surfaces don't fatigue you. This mower is capable of mowing at 20km/h shaving the amount of time you will spend mowing in your backyard. Fitted with a 43.5 Litre fuel tank to ensure you can complete a full day of mowing without having to stop and fill up before the days out! The hydraulic deck lift make life so much easier and the cup holder allows you to also store you favourite drink to kill off your thirst. 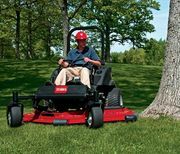 Toro takes safety very seriously which is why the Groundsmaster comes with a roll-bar and seatbelt for protection against accidents that the operator doesn't see coming. And when it is not practical for the roll bar to be up it can be temporarily lowered if you desire.